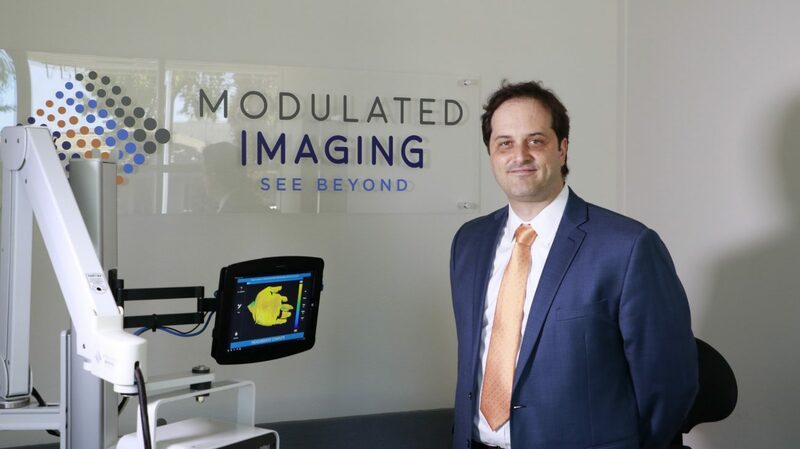 Modulated Imaging, Inc. a company founded by UCI alumnus David Cuccia Ph.D., has successfully closed their Series A financing round. The additional capital will help the Modulated Imaging team push forward as they work to show clinical value in the platform technology they have created. Modulated imaging builds light based imaging devices that give professionals transformative tools for preventing, diagnosing, and curing medical skin conditions. The company’s unprecedented science profoundly impacts the health and resilience of skin, and increases quality of life. Originally housed within the Photonic Incubator at the Beckman Laser Institute at UCI, the company has since expanded to a 6,000 sq. ft. building in Irvine. Earlier this year in January, Modulating Imaging announced that it received clearance from the FDA for its Ox-Imager CS technology. This device is designed to assist clinicians with the identification of lower limb vascular issues, so that patients can receive appropriate, timely treatment. With FDA authorization, Modulated Imaging can now launch the technology at clinical centers throughout the United States.